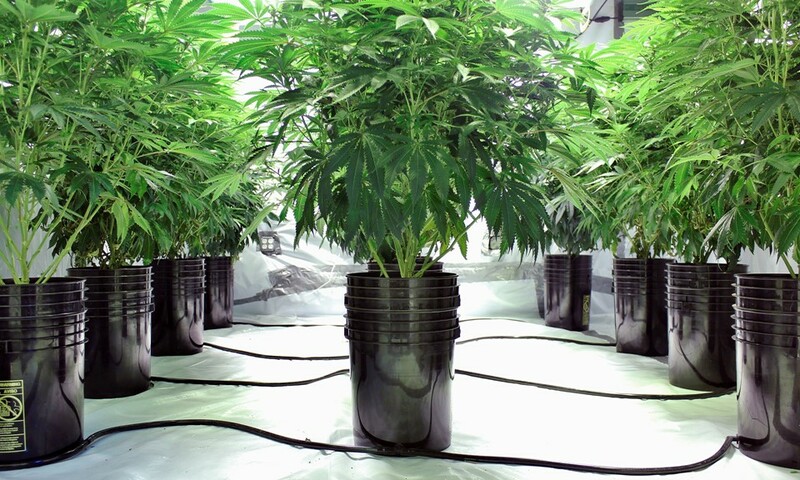 Harvesting your cannabis garden is often the most exciting time when it comes to growing. All your previous efforts culminate in this moment when the decision is made to cut your crop. Because so much is riding on the decision to harvest, it’s important to understand what is happening on a chemical level with the cannabis plants. What do you need to consider when harvest approaches to ensure the best crop possible? The time recommended by the breeder is actually the least accurate measurement of when to harvest. Breeder information should be used to help determine your garden schedule, but it has less to do with when the plants are in peak harvest. A more accurate factor is looking at the stigma. You can make a solid estimate of when to harvest by tracking the stigma’s change in color from white to orange. Observing your buds’ trichomes offers the most accurate indication of when cannabis is ready to harvest. 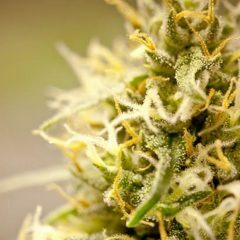 It is in the trichomes that the actual science behind when to harvest exists. You’ll need a microscope to actually observe the trichomes. Handheld microscopes ranging from 30x-100x will allow a clear view of the color of the trichomes and can be purchased at any growing supply store. With a microscope in hand, a grower can see the transformation as the plant reaches peak potency. In this stage, the trichomes go from clear to opaque and end in amber. During this change the trichomes reach their maximum THC content and then begin to break down due to exposure to oxygen and UV rays. The result is CBN (cannabinol). 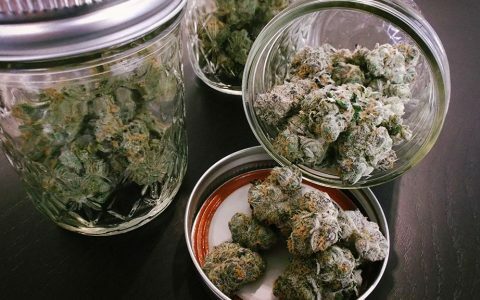 Though CBN is a result of THC degrading, like other cannabinoids found on the cannabis plant, it has its own unique set of benefits. CBN has been linked to providing aid for insomnia, pain, and inflammation, as well as many other benefits. It does not, however, have any psychoactive effects. High CBN levels are commonly associated with the term “couch lock,” which speaks to its highly sedative qualities. THC, on the other hand, is very psychoactive, cerebral, and less fatiguing, while offering an array of medical benefits. Regardless of CBN’s benefits, most growers try to prevent the THC trichomes from degrading into CBN. To harvest your crop with the highest levels of THC, it’s best to start by paying attention to the stigma. Once the stigmata start to change colors, it’s a good time to begin observing the trichomes through a microscope. Look for clear trichomes, which indicate that the buds are young and still developing. From this point forward it’s both a fun and good idea to observe the trichomes daily. It’s good practice to look at different bud sites on the plants, as the top colas might reach maturity faster than the bottom buds. Eventually there will be a shift from clear trichomes to an opaque white, which indicate full maturity. At this point the trichomes are no longer producing additional THC. Unfortunately, all trichomes do not develop at the same rate and you will begin to see some amber trichomes before you see a consistent opaque. Once amber trichomes appear, CBN is now starting to develop as a result of the THC breaking down. You can presume at this point that you’ve reached maximum THC and your plants are safe to harvest. If you have the time and observe less developed buds lower down on the plants, you can split the harvest in two. Dividing your harvest allows the bottoms of the plants to continue to develop after the tops have been harvested, which helps increase overall bud quality and yield. It’s important to note that every gardener has a different opinion on when to harvest their cannabis plants. 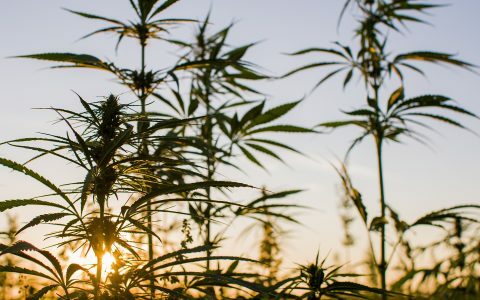 Some gardeners like to harvest earlier while others prefer later, which is why an understanding of the science of cannabis botany is so beneficial. 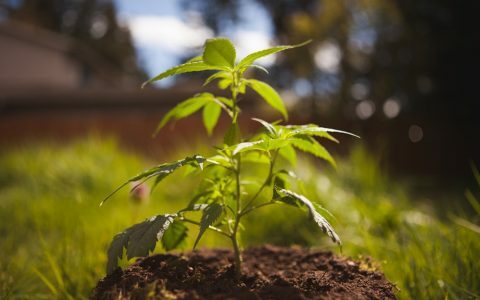 Growing cannabis is a continual learning process. Depending on the crop, an ideal harvest may be early or later in the trichome development. Because of this variability, growing the same genetics and working with the same strains for more than one harvest is encouraged. If you’re curious to explore the benefits of CBN but are unsure about letting your plants’ THC content diminish, you can explore other options. Unfortunately, CBN products are not yet easy to find but they do exist. Mary’s Medicinals out of Colorado produces 5 mg CBN capsules that are an excellent way to give you a clear understanding of the effects. Other products include Ethos sleep tincture, which has increased levels of CBN as well as THC, valerian root, and chamomile. Ironically, a less conventional way to explore the benefits of CBN is to ingest cannabis that has been improperly stored or harvested late. Thanks for the info. What about withholding water before harvest, and what about flushing? I can think of no reason for withholding water before harvest. You just don’t want to water a couple of days before harvest or it will take your plants longer to dry. Flushing? You will Never need to if you water from the bottom. I grow in 2 gal Perfect Pots in Happy Frog potting soil. My pots sit in 12″ black plastic Mondi saucers (these saucers are thick and ridged and will last a life time). When it’s time to water fill the saucer with 1 quart of your liquid fertilize. The liquid fertilize will wick up into the soil in the right amount so you never over water and the top couple of inches of soil remain dry. Two things, plants deposit their waste in the upper layers of the soil and pests don’t care for dry soil. And if you’re growing for Quality only use 1/2 the recommended dosage. hello was wondering , does a Mary Jane plant keep producing thc up til u pull ur plants? I’ve been doing some reading and growing. What I know from experience and literature is that a particular kind of trichome (there are three kinds. The kind to which you are referring has a “golf ball on a tee” shape. Some would liken the shape to a mushroom. They are tiny and you need a visual aid to see the detail.) produces thc. The trichomes grow near the flowering part of the plant (I’m avoiding botanical terms) and on the inner part of “sugar leaves” that grow out of the flowering area. These trichomes change in color as they age. They start out as crystalline/translucent, then turn a milky white color, then brown. 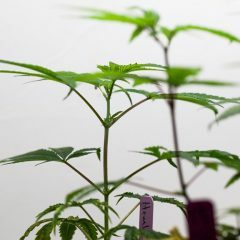 Some researchers offer the data that the trichome holds the most thc in the crystalline stage and presumably be the most potent, well before traditional growers harvest their crops. Growers say that a thc “high” is better when the plant/trichomes are harvested later, when about 15-20% of the trichomes have developed a brown color. As trichomes age, the thc molecules become unstable form more complex molecular structures. Growers often say that the euphoric effect is more physical as the cannabinoids convert to more complex varieties. And, yes, all through the flowering period, the plants continue to produce thc trichomes. Later in the flowering stage, smaller growing tips develop trichome clusters and larger buds are covered with trichomes that resemble freshly fallen snow through a jewelers’ loupe. This growing season, I came upon a surprising aspect to harvesting. 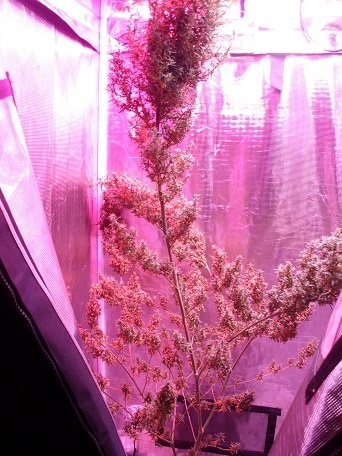 I was growing the Blue Dream strain outside, and in early September, about 5-6 weeks before the recommended harvest time, days of moderate to heavy rain were forecast and the rains began, so I decided to move the plants inside a structure. While shifting one of the pots to a dolly, a large branch broke off. I was going to toss the branch in the trash, while cussing profusely, since it was so far away from “harvest time.” But instead, I decided to hang it up to dry and perhaps to trim and cure the buds some time later. (“you never know…”) At the time of the break-off, the buds were rich with crystalline trichomes, but very few milky white, and no browns. The branch was about 6 feet long. I hung it up and forgot about it until a few days ago, when I trimmed it and began the curing process. Just yesterday, I sampled a bud, and to my utter surprise, the sample was incredibly potent. Now, I wonder about the conventional wisdom of waiting until the recommended time for harvest for peak potency: whether it’s really necessary. I guess that if a branch breaks off, it’s not tragic. Treat it as if it’s still effective. It probably is. I have a strange situation with my plant. It’s a pure Sativa. ( C99 x Thai ) This is the first time I have tried growing a plant like this. The flowers are lanky, the plant grew with very few large Veg. leaves, just small leaves around the flower sites. The entire plant is filled with white pistils but, I don’t see any plump seed pods like you would normally see on a Bud. As far as the number of days it was suppose to take to flower has passed by two week now & yet, the pistils are still white. It’s as if it just stopped the flowering cycle. Also, along the bud sites, some of the small leaves have died. Anyone have any ideas, comments, suggestions, solutions ? Oh, it might help to know. I have two 240w full spectrum lights inside the 4×4 gorilla grow tent. Those look like male flowers, they won’t produce large buds. Only the ladies do that. Has anybody tried bone meal? My plants are Thing #2 and Chemo. They love this nutrient. Currently using 100 % coco coir + sea grow once a week and then water chicken manure tea every other day. Good results!